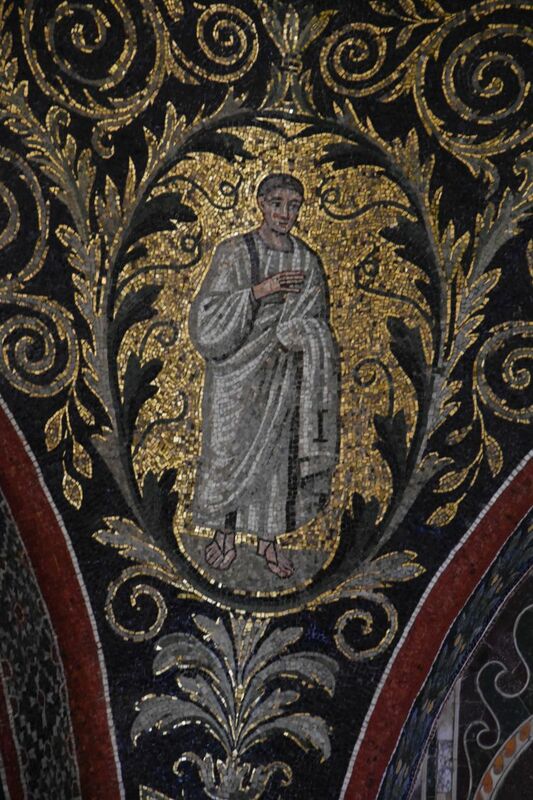 Saint Apollinaris is said to have brought Christianity to Ravenna in the 1st century. Two basilicas are named after him, Sant’Apollinare Nuovo and Sant’Apollinare in Classe. “Nuovo” is the older church, already inaugurated in 504 as an ostrogothic Arian Basilica dedicated to Christ the Redeemer. Under Byzantine rule, this church became othodox-catholic, and in the 9th century the relics of Saint Apollinaris were transferred from Classe to Sant’Apollinare Nuovo – hence called “nuovo”. The original Basilica for Saint Apollinaris was built in Classe, near the port. 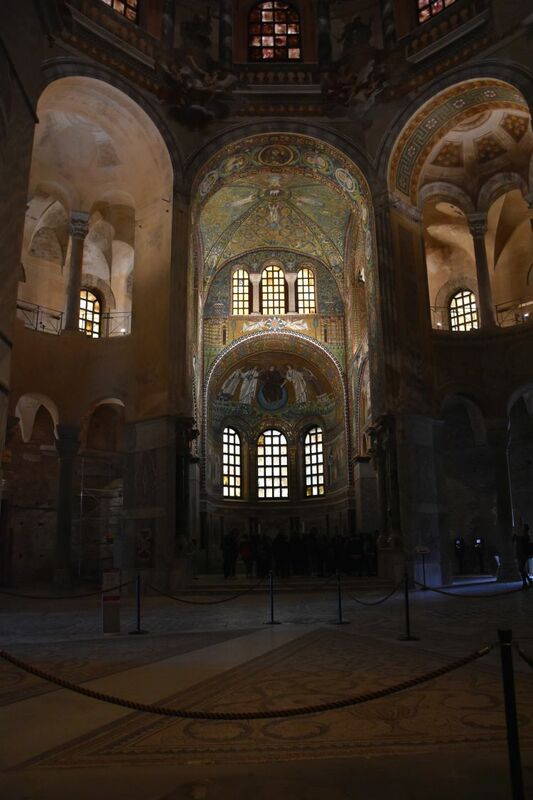 It was consecrated in 549 by Maximian, when Ravenna was under Byzantine rule. Both basilicas are just wonderful – let us dicsover them. 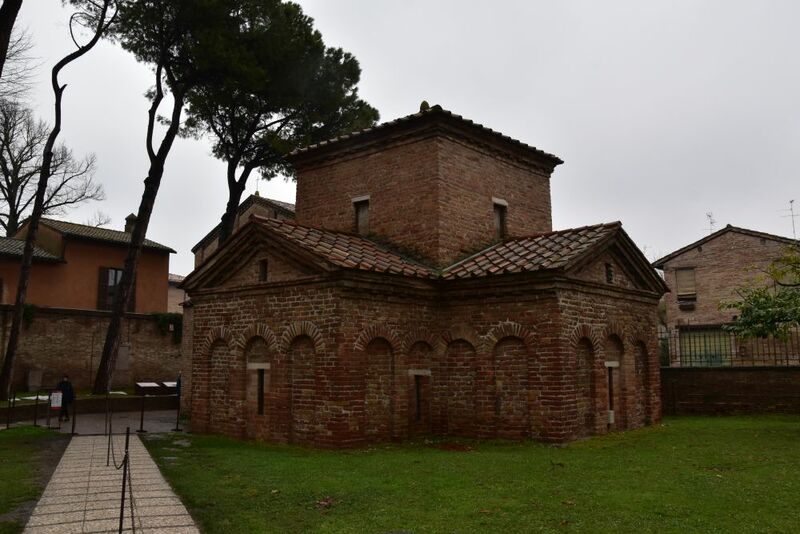 two from the Western Roman Empire (402-476): the Mausoleum Galla Placidia and the Orthodox or Neonian Baptistery. 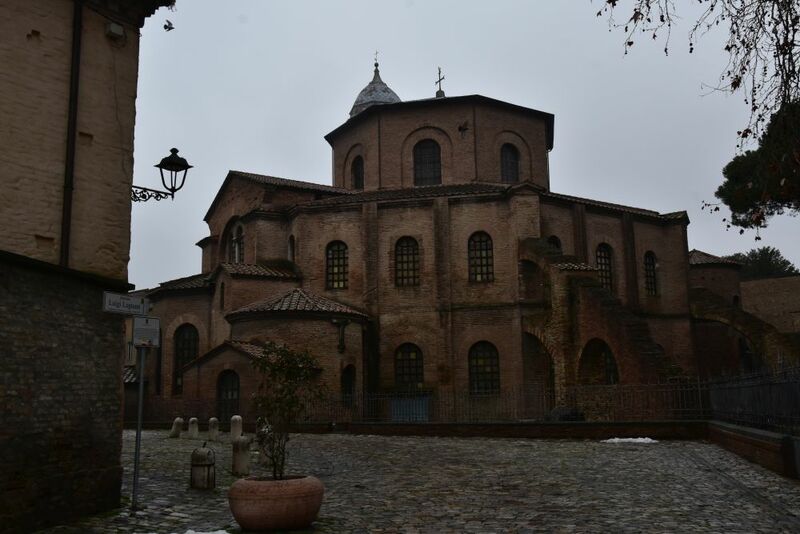 four from the Ostrogothic Rule (493-540): Theoderic’s Mausoleum, the Arian Baptistery, Sant’Apollinare Nuovo (remodeled during Byzantine times) and the Archbishop’s Chapel. 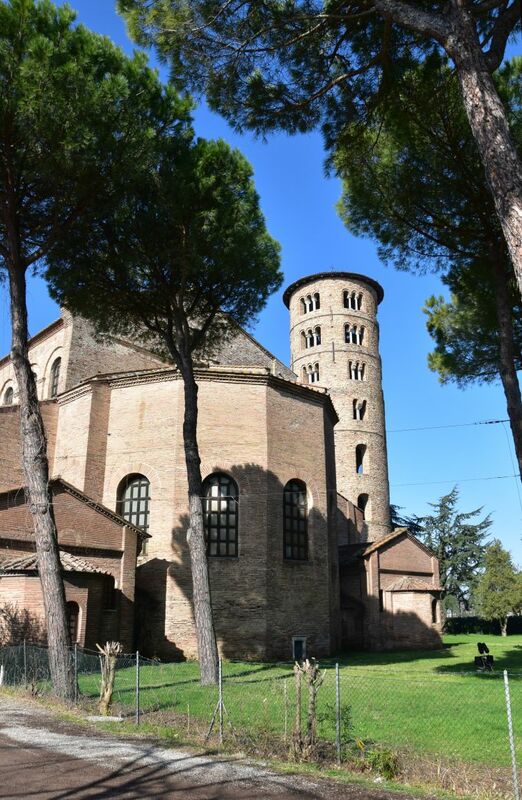 two from the Byzantine Rule (540-751): San Vitale and Sant’Apollinare in Classe (both started during Ostrogoth times, but inaugurated in Byzantine times). Yes, the older of the two basilicas named after Saint Apollinaris is called “Nuovo”. This is the view from outside. The bell tower is round with the typical double and triple windows. The narthex has been added later. Inside the basilica measures 35mx21m. The nave is flanked with two rows of twelve columns in Greek marble. The mosaics are above the columns. … Maria and Jesus with the three Magi. 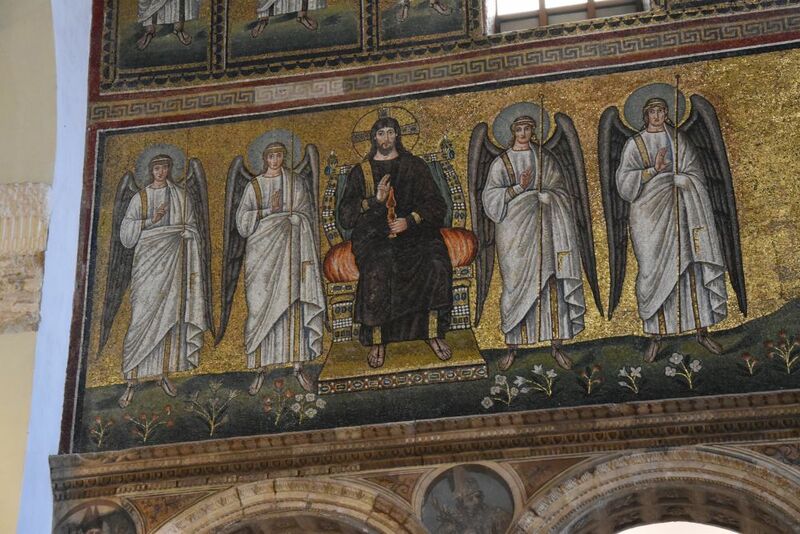 On the right hand side, martyrs are walking towards Christ sitting on his throne and flanked by four angels. It is assumed that the processions of the martyrs have been added by the Byzantines. The former decoration of the Arians was different, perhaps a line of courtiers. Above the processions are 26 panels that describe the life of Christ (13 on each side). The example below shows the healing of the lame and the separation of the sheep from the bucks. Most interesting is this Last Supper. 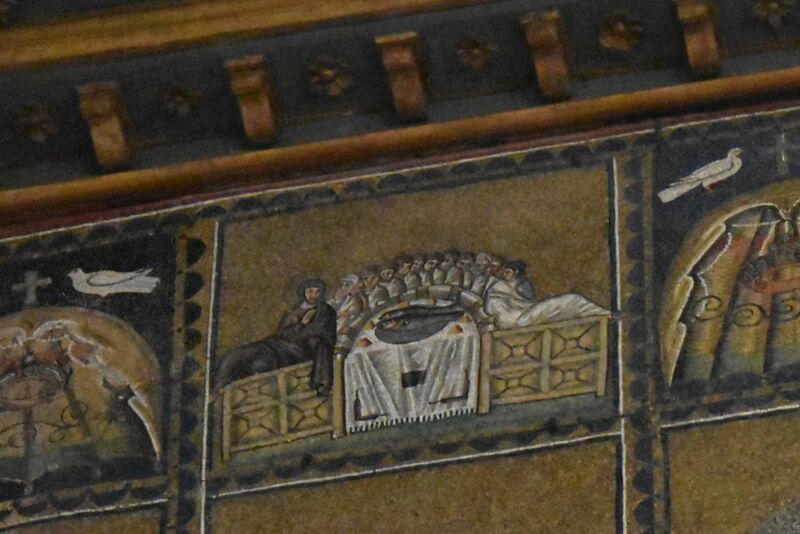 Christ and the apostles are lying on long chairs as the Romans used to do for their meals. Never before have I seen such a “Roman” Last Supper. But why not? Why should the apostles and Christ not have behaved like the Romans, when eating? Ursula and Leni intepret each of the 26 panels. It is like reading the Bible, and I have to admit, I read the stories from the Bible like people did at that time. With such beautiful mosaics it is a great pleasure to discover them and to enjoy, how the artists made the essence clear. For instance, a lame that carries his bed on his back has just been healed – it is simple and clear. 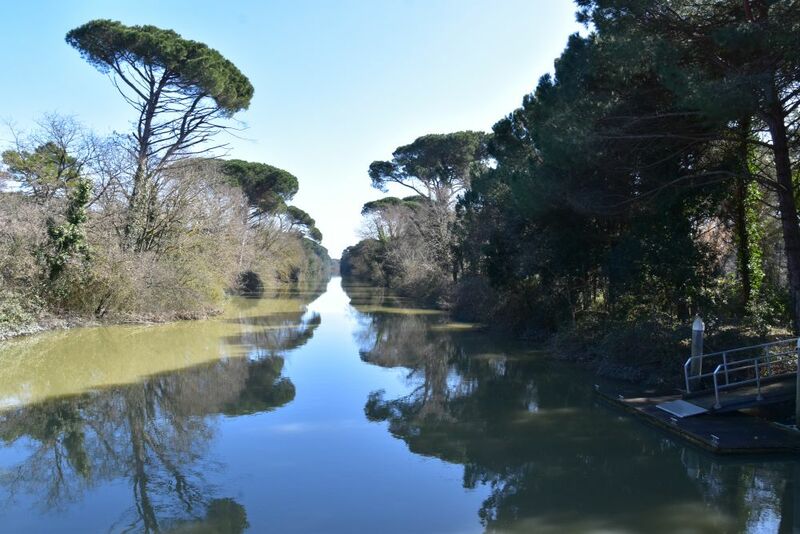 On a sunny day, we take out our car and drive south to Classe, the ancient port of Ravenna. Here we find the basilica originally dedicated to Saint Apollinaris, namely Sant’Apollinare in Classe. The nave is even larger, 55.5mx30.5m. The mosaic is in the choir. It shows Christ, symbolized by a cross. The cross is flanked by two angels. 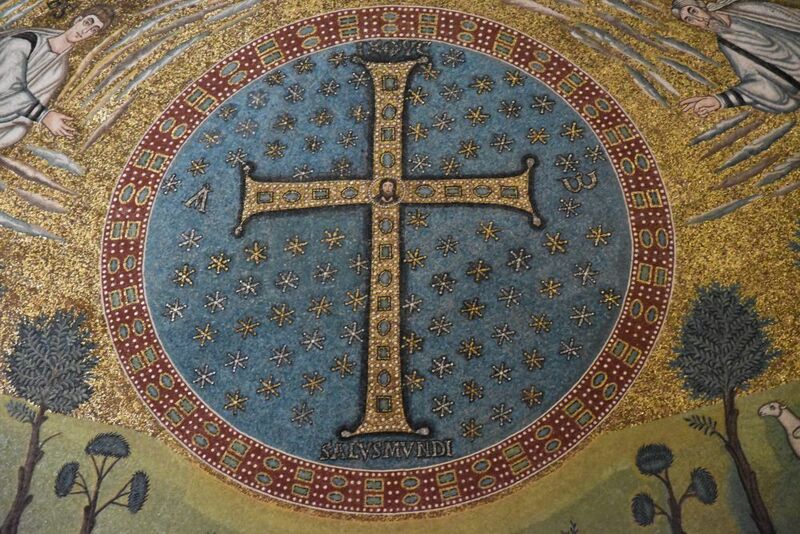 Below the cross stands Saint Apollinaris that the church has been dedicated for. He is preaching and talking to the audience in the church and to the sheep surrounding him on the meadow. Stones, trees, bushes, flowers and birds surround the Saint. In the middle of the cross, there is a small portrait of Christ. The evangelists are flying above the scene. I am surprised to see the bull of Lukas: It is portrayed from the side and from the front at the same time – very much like a Picasso painting. May be that Picasso has visited this Basilica as a young man? The lion of Mark looks very, very gentle, but may be this is what his evangelium is about… a story that should convey joy. At the side we find three old acquaintances that we have come across in San Vitale: Abel sacrifying a sheep, Abraham about to sacrify his son Isaac and Melchisedec bringing wine and bread. After all that culture we need a break and we benefit from the fact that the sun has started to warm Northern Italy. We drive to Fosso Ghaia and go for a walk in the pine forest. 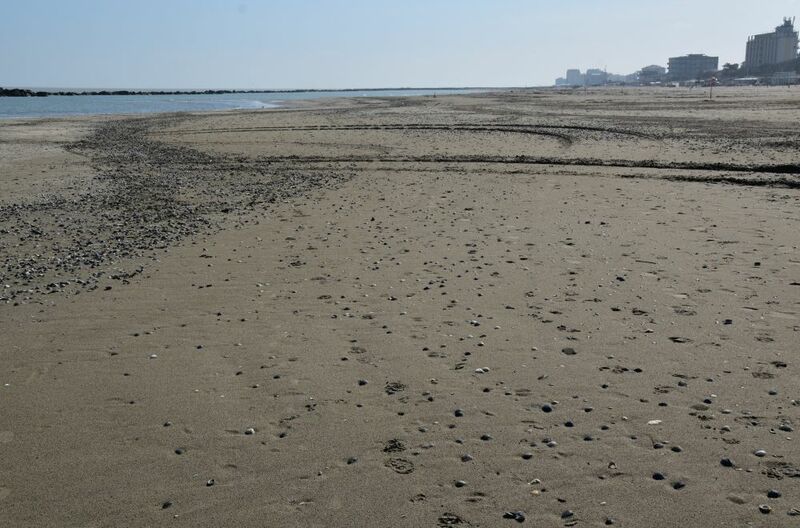 Then we drive to the Lidos or the beaches south of Ravenna. They are empty, empty and just empty. One lonely man is raking the sand. If he continues at that speed, he will never complete his work until Easter in about four weeks, when the first guests are expected and the beaches start to fill up with lines of arm chairs and umbrellas. I cannot imagine the crowd looking at this empty sand beach. We find just one (only one) restaurant open. It is full with craftsmen. They may be repairing the many holiday chalets and appartments that have their shutters closed right now. 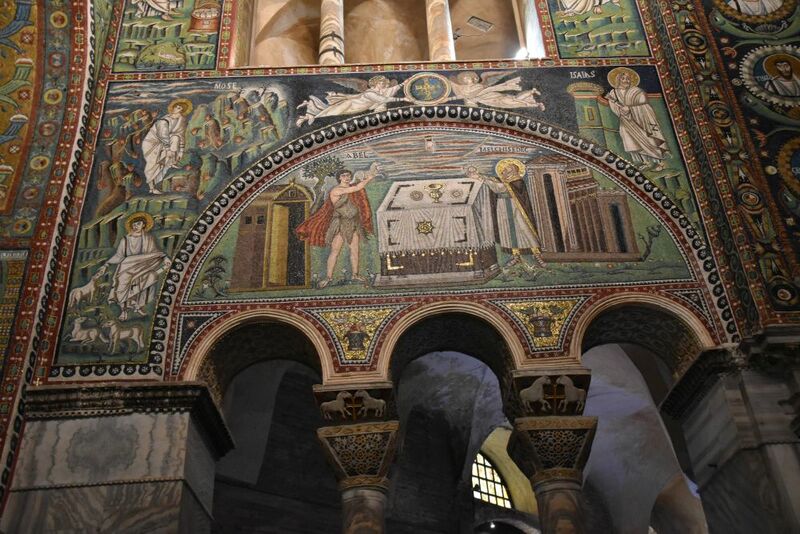 Jutta Dresken-Weiland: “Die frühchristlichen Mosaike von Ravenna”, Schnell+Steiner, Regensburg 2016. 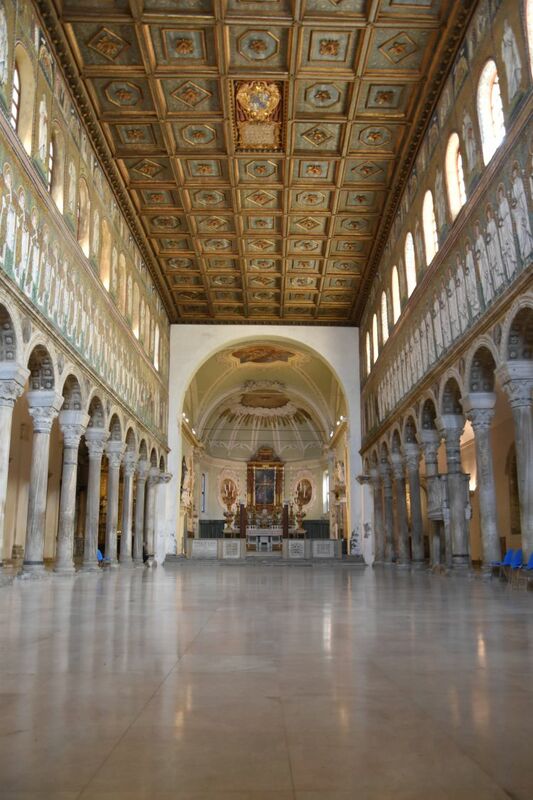 The Basilica San Vitale has been inaugurated during Byzantine Rule, by Bishop Maximian in 547. 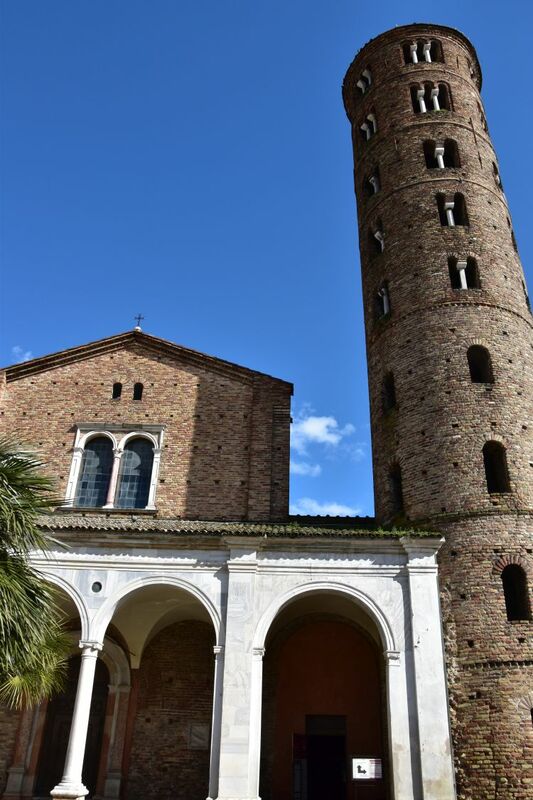 The Ostrogoths had started building San Vitale in 526. The building plan of San Vitale combines Roman and Byzantine elements. A Roman element is the use of clay pipes for the dome. A Byzantine element is the octogonal plan. Charlemagne liked the octogonal plan of San Vitale so much that he modeled his palatine chapel in Aachen after it (Rizzardi, p. 74 and Dresken-Weiland also mentions that). 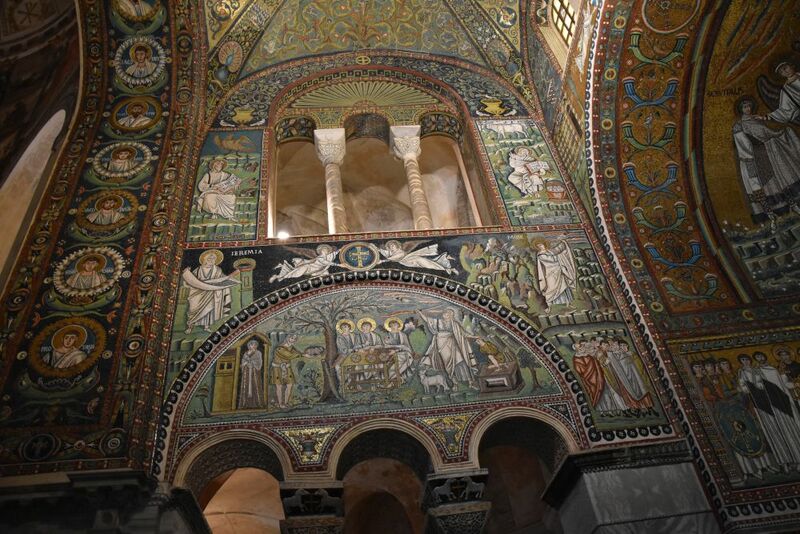 Inside the choir is beautifully decorated with mosaics. 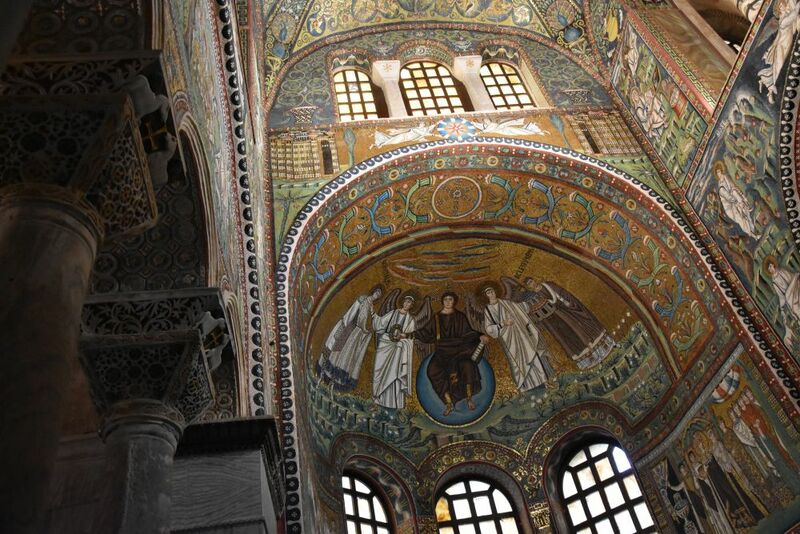 They are the best preserved Byzantine mosaics from Early Christianity (id est around 500, Rizzardi, p. 72). 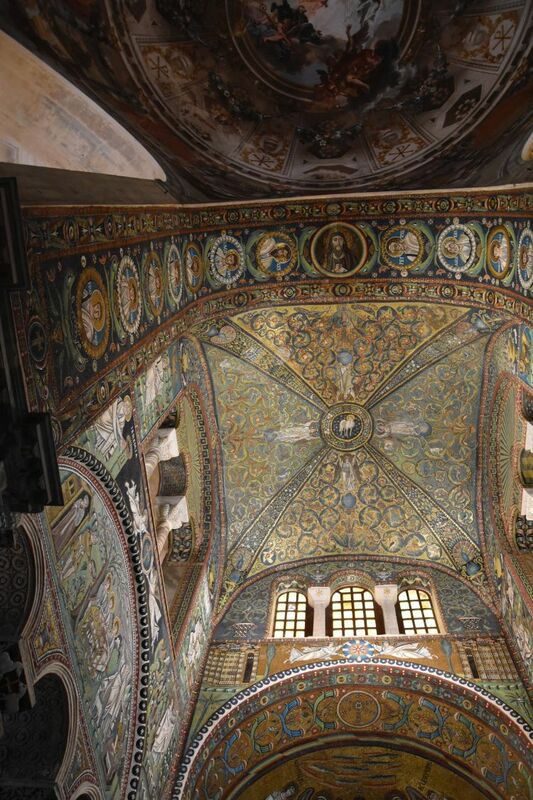 Let us discover the San Vitale choir with the mosaics shining in green-blue-golden-white. 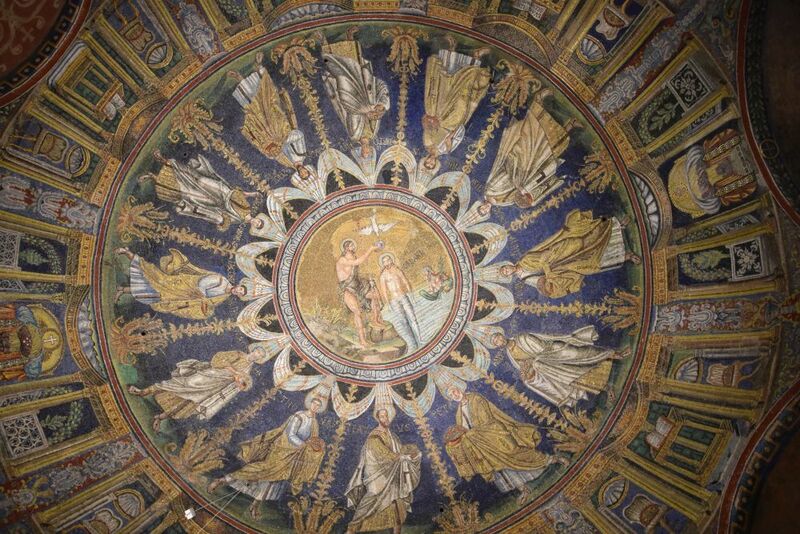 In the center of the cupola the Lamb of God or Agnus Dei looks down at us as a symbol for Christ. He is flanked by four angels that stand in beautifully decorated gardens with birds and animals. The portrait of Christ himself is in the arch, along with the portraits of the apostles – next to Christ Petrus (grey hair) and Paulus (bald head). In the front niche sits Christ, flanked by the two archangels and then to the left San Vitale (his martyrium is said to have happened here) and to the right the Bishop Eclesius who initiated building the cathedral. They all stand on a meadow with flowers and birds. 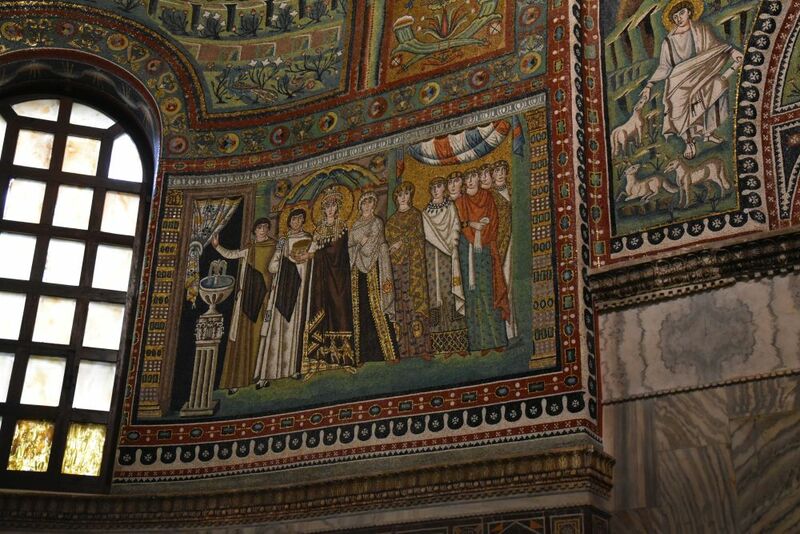 To the left of the choir there is a mosaic panel that shows the Byzantine Emperor Justinian in the middle amidst his men and warriors. The Bishop Maximianus who inaugurated San Vitale in 547 is labeled. To the right stands his wife Theodora amidst her accompaniment. She is said to be the daughter of a bear trainer and she became a very influential empress in Byzantium. At the entrance to the choir there are two Biblical scenes. The first scene below shows Abel sacrifying a lamb and Melchisedec bringing bread and wine. To the left from the scene stands Moses as a good shepherd (caressing a sheep) and again Moses taking of his sandals to climb Mount Horeb where he finds the burning bush. To the right above the prophet Isaiah looks down at the scene with Abel and Melchisedec. The second scene centers around Abraham. He is serving food to the three vagabonds that turned out to be angels. Three bread loaves are on the table and Abraham brings a lamb while his wife Sarah watches the guests from the doorstep. To the right, the hand of God is stopping Abraham from sacrifying his son Isaac. Above the scene are the prophet Jeremiah (left) and to the right Moses receiving the Ten Commandments. 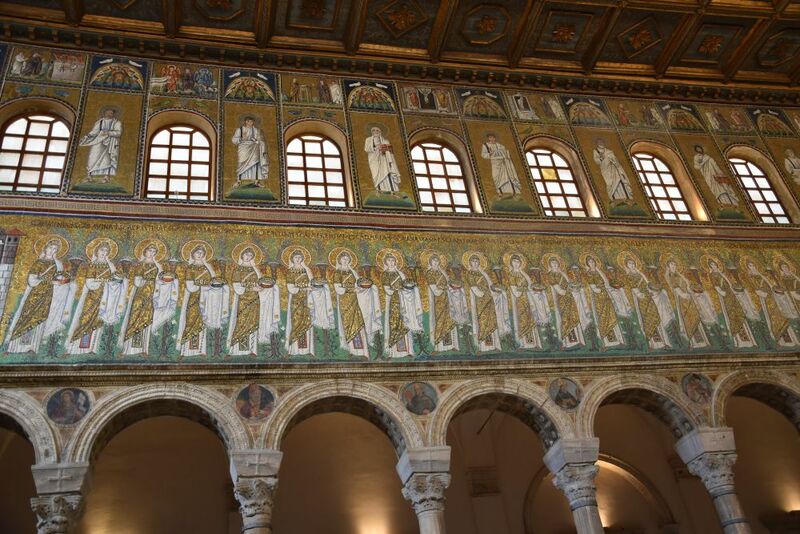 Another overwhelming assemblance of mosaics in Ravenna after the baptisteries and the Mausoleum of Galla Placidia… and there will be more – we have not yet seen Sant’Apollinare Nuovo and Sant’Apollinare in Classe. Now I will tell you about the Ostrogothic Arian Baptistery and for comparison of the christening scene recall the Roman Orthodox (Neonian) Baptistery. To conclude, we will visit the Mausoleum of Theoderic to say good-bye to him and his Ostrogoths. (In the fourth ostrogothic World Heritage which is the Archbishop’s Chapel with Christ as a warrior it is not allowed to take pictures). 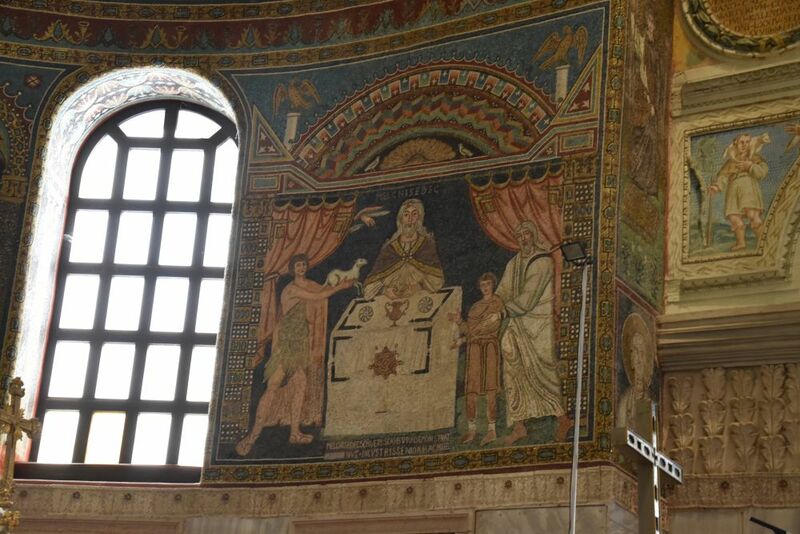 Remember the christening scene in the Orthodox Baptistery from my previous blog? Saint John holds a bowl to baptize Christ and the pigeon flies above – to me it seems to bless the water in the bowl. 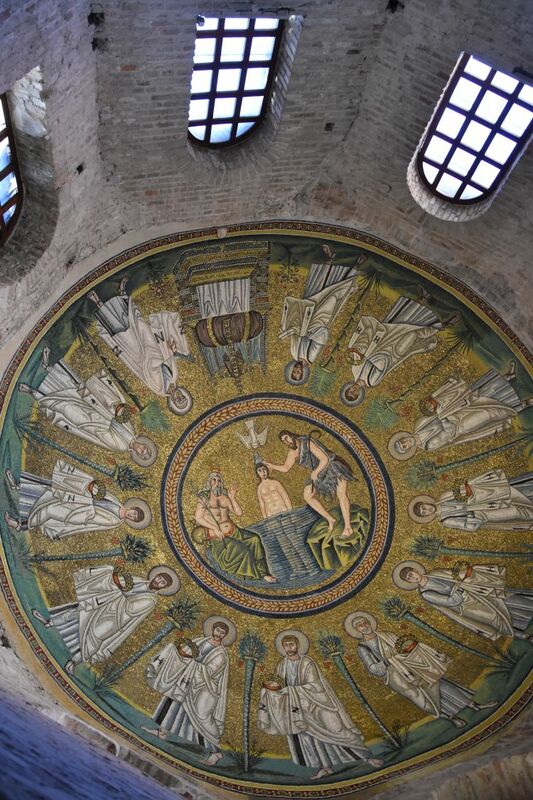 Historians assume that this christening scene has been altered later and that the scene in the Arian Baptistery reflects the original mosaic with Saint Joan holding his hand on Christ’s head and the Holy Spirit really flowing from the pigeon on to the head of Christ (see farther down). By the way you can clearly discern the apostles Petrus with his grey hair (bottom left) and Paulus with his bald head (left from Petrus). The Arian baptistery is smaller than the Orthodox Baptistery. The short absidioles at the bottom of the facade indicate that the building used to be much higher. Inside I utter another “aaahhh”. The room is full of modest solemnity with the christening scene and the procession of the apostles in the cupola. The apostles move towards the throne of Christ, and Petrus (with his grey hair) as well as Paulus (with his bald head) are on both sides of the throne. 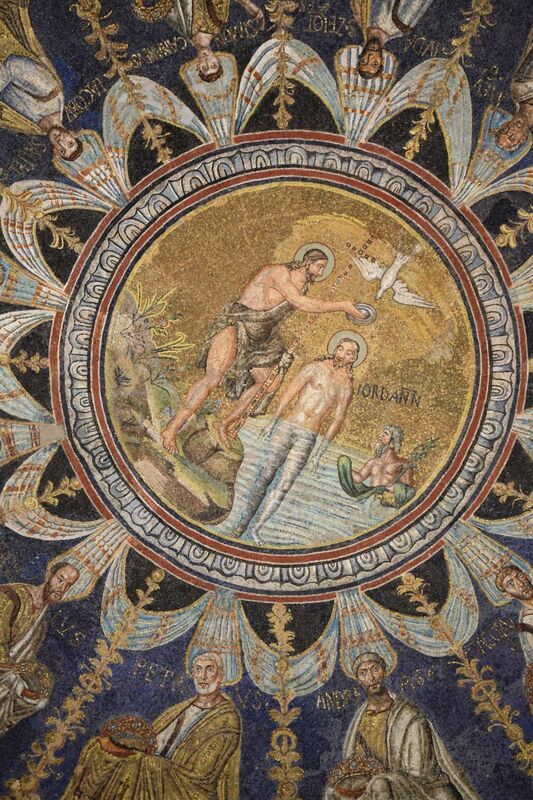 As mentioned abovem this christening scene is different from the one in the Orthodox Baptistery. 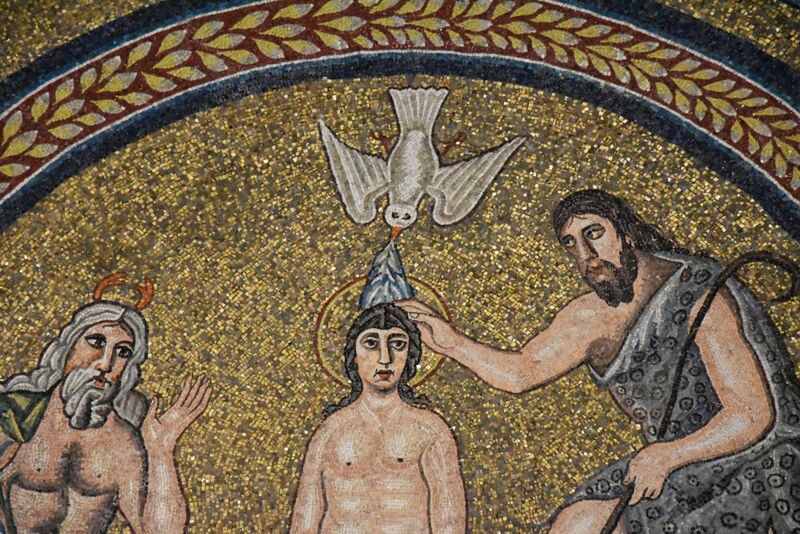 In the Ariane Baptistery, Saint John holds his hand on Christ’s head and the pigeon pours Holy Spirit on to Christ’s head. Furthermore, Saint John, dressed in his fur coat, holds a walking stick instead of a cross. The god of the river Jordan is of the same size as the main figures and he has crabs on his head. 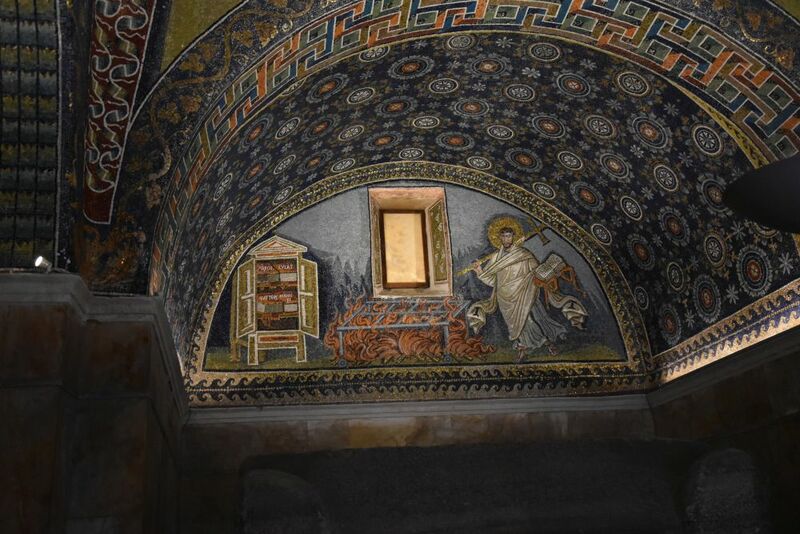 The two scenes are very similar, but different, and the setup of the Arian Baptistery is deemed to be original. I love how gently Saint John looks at Christ. The Arian Baptistery was built around the year 500 by the Ostrogothic Arianic Christian community. The Ostrogothic king, Theoderic the Great, belonged to the Arianic community. Arians believe that Christ is the son of God, “but that he is distinct from the Father and therefore subordibate to him”, wikipedia explains, as opposed to the Orthodox-Catholics (still one church at that time) that believe in Trinity – God, the Holy Spirit and Christ are one God in three divine persons. The Orthodox-Catholics declared the Arianic concept to be heretic and they persecuted them. 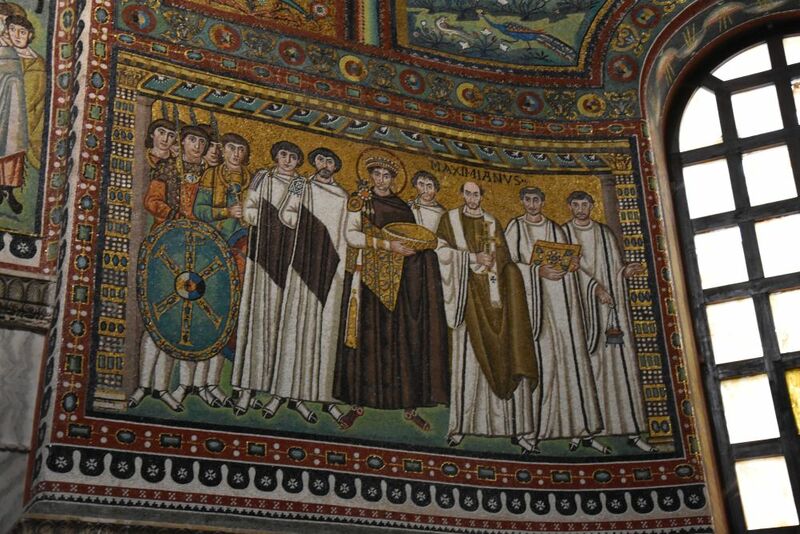 The Arianic community in Ravenna was small. This might explain, why their baptistery is smaller. Historians say that their mosaic had been completed in two stages. They conclude this from the fact that under the throne, the grey-headed apostle Petrus and the bald headed apostle Paulus as well as under the third apostle next to Paulus the lawn is of much darker green color than under all the other apostles. Only around the throne, there are flowers. And in addition the palm trees look different. The historians assume that, when the throne, Petrus, Paulus and the third apostle had been accomplished, the Arians run out of money – and only later they were able to complete the procession of the apostles. I love the unostentatios solemnity of this small baptistery. Being baptized here must have been a great experience. I think that Theoderic was a very modern person. He is said to have been tolerant and cosmopolitic – I sense, as if he had lived through the times of Enlightment. In his mausoleum, we say good-bye to him. 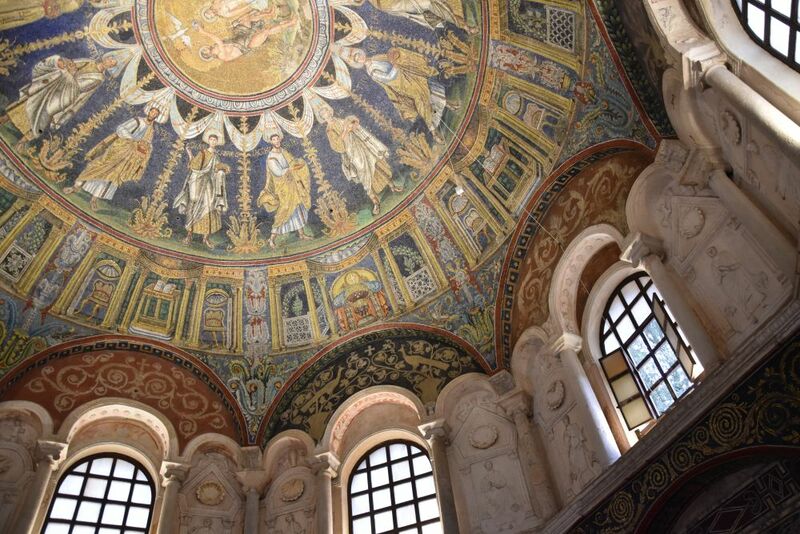 The mauseoleum is one of the eight monuments of Ravenna in the World Heritage List. It consists of carefully cut Istrian stone blocks and excels by its 10.76m monolithic dome weighing 230 tons (Source: Rizzardi). On the second floor stands the porphyry sarcophagus of – as historians think – Theoderic. When the Byzantines took over in 540, they removed his body, because they were against Arianism. Why? A belief that allows for a tolerant and cosmopolitic attitude is wonderful – and I would love to see more of that right today. 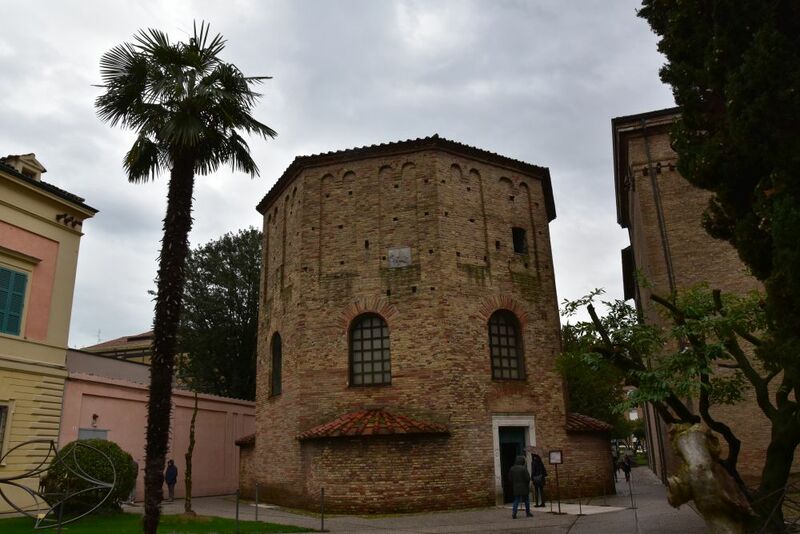 Let us start with our impressions from Roman times, the Mausoleum of Galla Placidia and the Orthodox (Neonian) Baptistery. The latter we will compare later with the Arian Baptistery. Galla Placidia was the daughter of Theodosius, the last emperor of the unified Roman Empire . In her second marriage Galla was the wife of Constantius, Magister Militum of Honorius, the first emperor of the Western Rome Empire (after the partition of Rome in 395). For some years Constantius ruled together with Honorius. Galla’s son, Valentianus III, became emperor of the Western Roman Empire in 425. Until 437 and until he was 18 years old, she managed the empire. 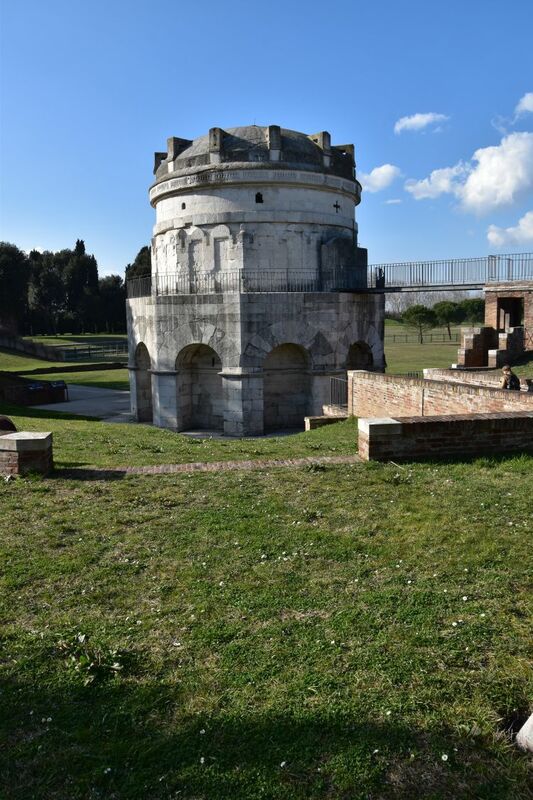 During this time – in 425 – she had her mausoleum built. This is the outside view of the mausoleum with its four transepts. The transepts are ornated with blind columns and arcades. Inside, we find a solemn atmosphere primarily in the colors blue and golden. The cupola is a blue sky filled with stars, with the cross in the middle and the four evangelists in the corners. I love the decoration band around this sky full of stars. 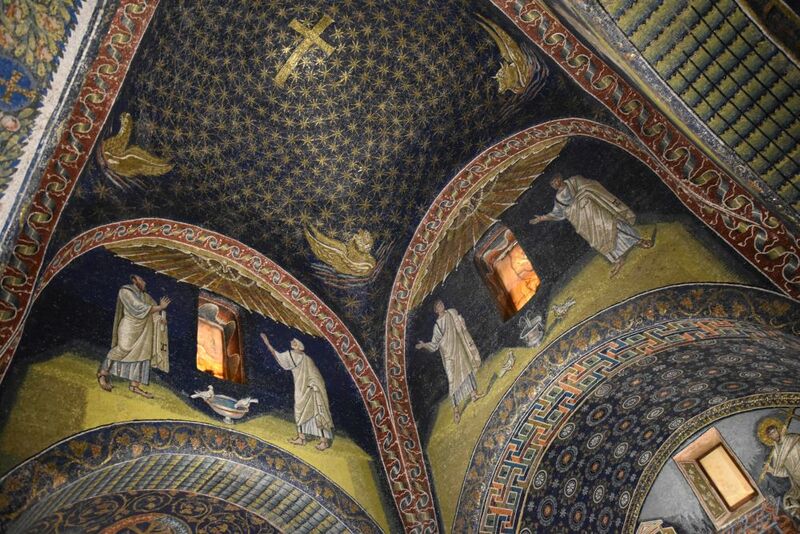 Below the cupola there are four mosaics with two men, a fountain and pigeons. In two of the mosaics, the pigeons are drinking from the water. These two pigeons drinking water decorate many, many souvenirs in Ravenna – cups, plates, mouse pads, scarfs, tablecloths, t-shirts etc. The elegant men next to the pigeons have not been identified. 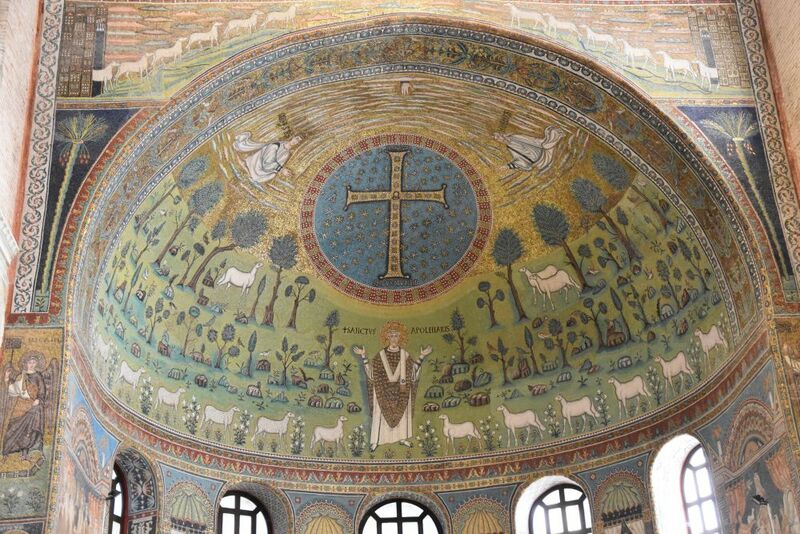 The third transept hosts the mosaic depicting Christ as the good shepherd – he is caressing one of his sheep – and the animal obviously enjoys that. 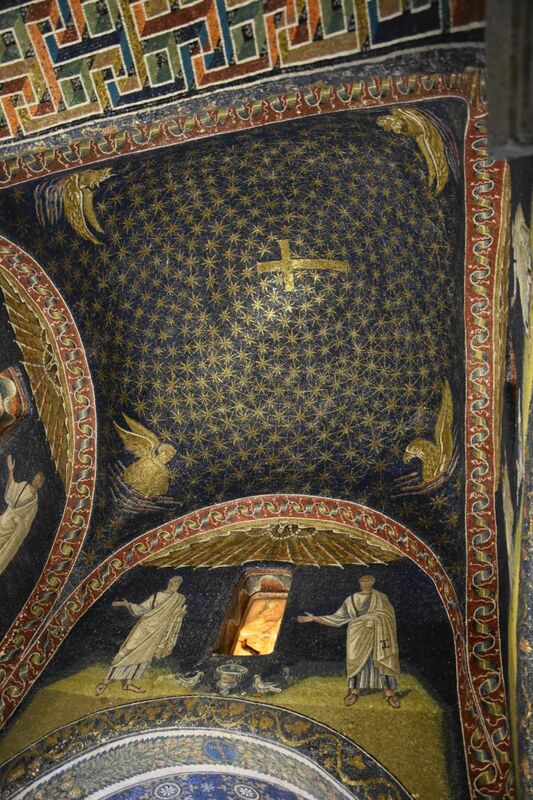 Last the fourth transept shows the martyr Laurentius or Lawrence moving towards his martyrium, the grill, which is next to a bookcase with the four gospels. The decoration in primarily blue and golden colors creates a solemn atmosphere. Very, very beautiful. 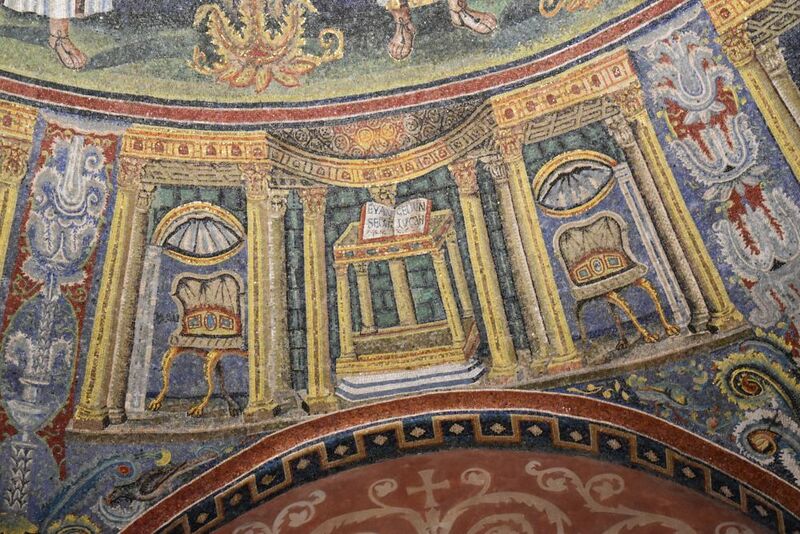 Galla Placidia was surely an intelligent woman, but in addition she had a good taste. We looked around and around, we checked out every detail and, after having stepped out, I had to go back to get another glance. 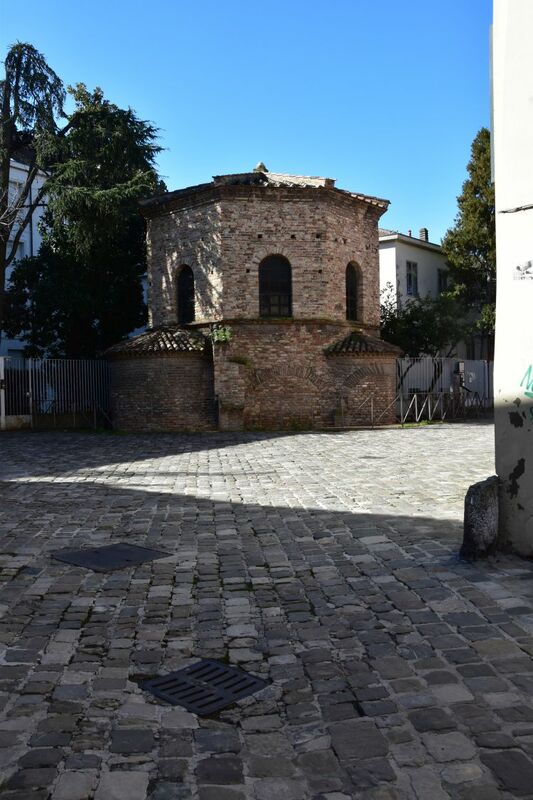 The Orthodox Baptistery is the second testimony of Ravenna as the capital of the Roman empire. It has been accomplished by Bishop Neone (450-476). 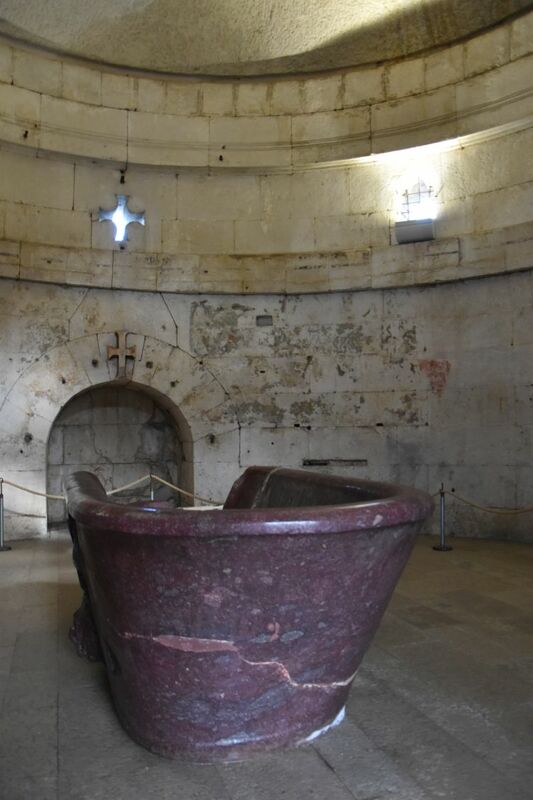 This is why it is also called “the Neonian Baptistery”. The baptistery is what remains from the Basilica Ursiana which in the 18th century has been replaced by a new cathedral. This is the view from outside. An interesting detail are the pilaster strips (Lisenen) and round-arch mouldings (Rundbogenfriese) – blind columns and arcades. This decoration has been in use in ancient Roman times, in Byzantium and in Ravenna. 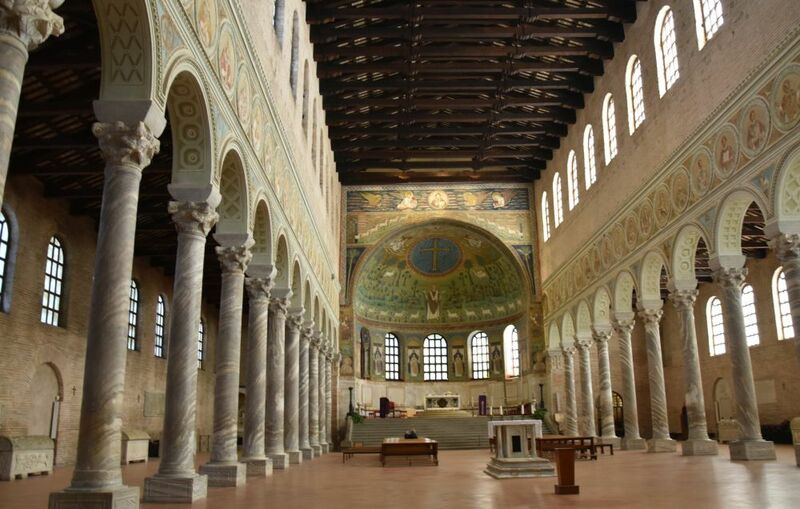 In Ravenna the Langobards picked it up and integrated it in their Lombardian architecture. From here the Romanesque architecture spread throughout Europe in the 11th century. 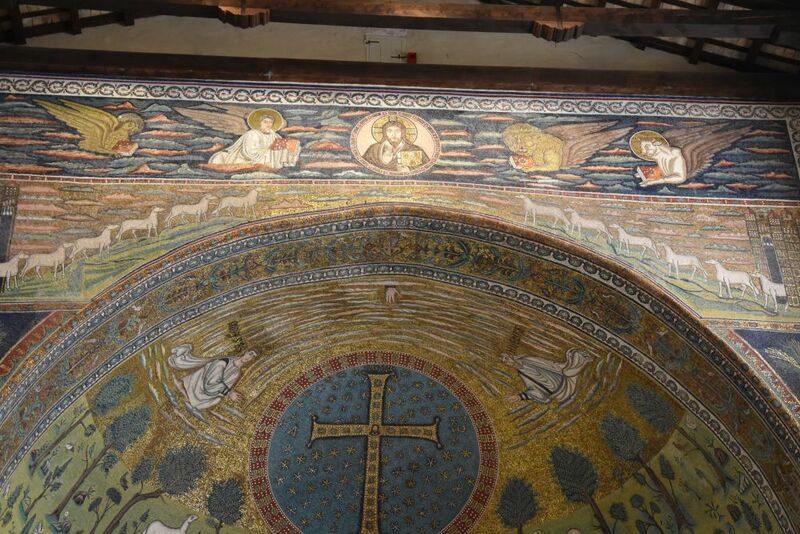 As this is a baptistery, the decoration centers around christening. The top of the cupola shows Christ standing in the river Jordan. He is being christened by Saint John, while the god of the river Jordan watches the procedure. Around this scene the apostles form a procession. The outer circle contains a band of four double niche constructions alternating between a desk with the bible surrounded by two chairs (see below) and the throne of Christ in a garden (see above). Windows give light to the baptistery. Next to the windows are plaster figures – perhaps prophets. 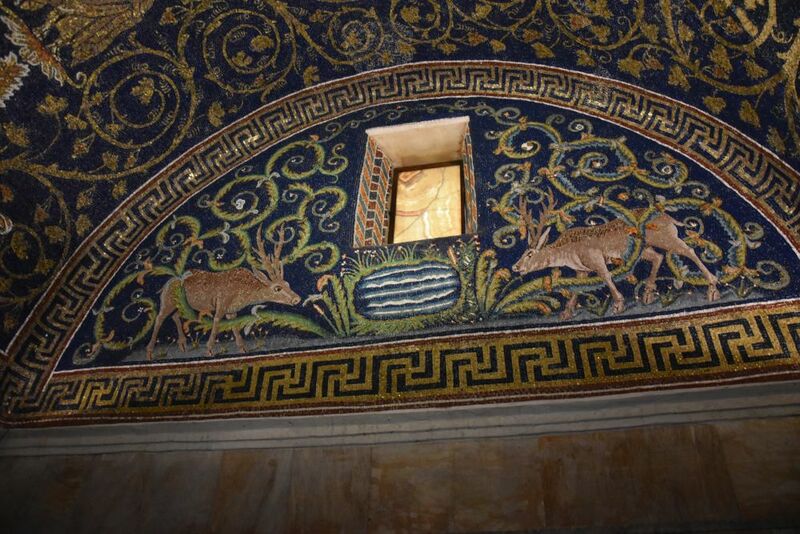 Below the windows are absidioles that once were much higher and contained (lost) mosaics showing biblical scenes. 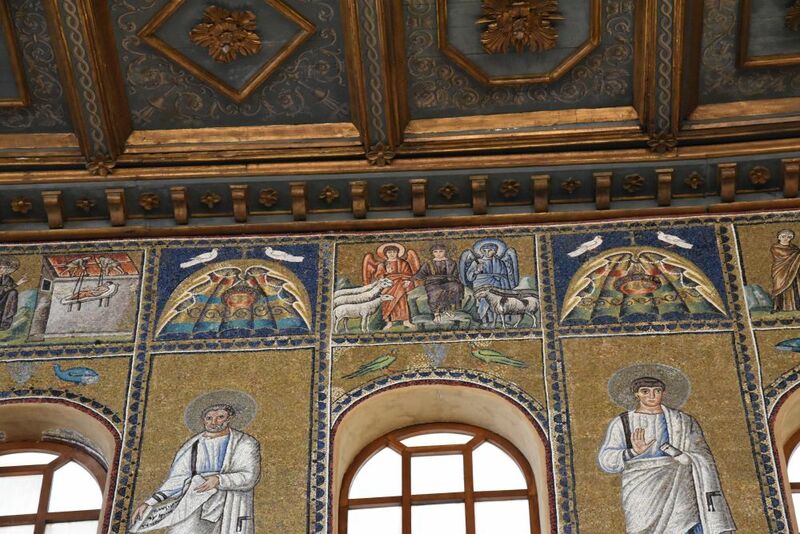 The spandrels connecting the absidioles are decorated with mosaics showing (unidentified) men sourrounded by blue and golden. 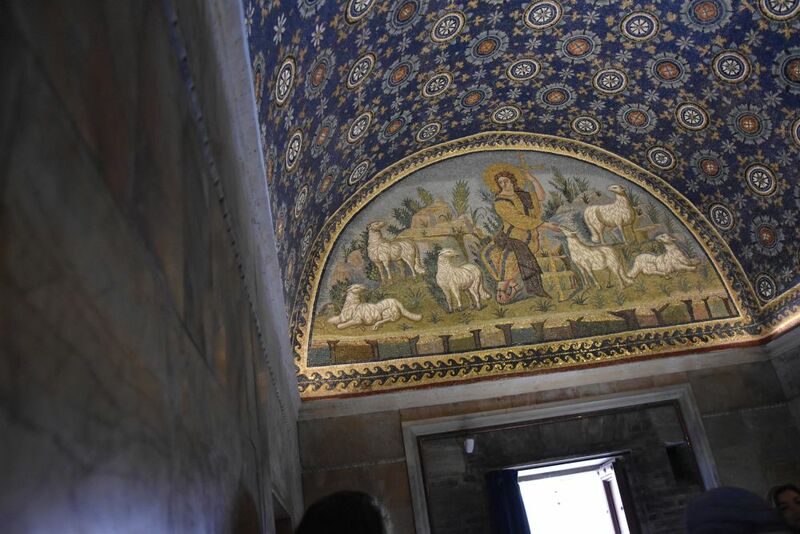 When entering the baptistery, I opened my mouth – aah – and just stared up at the cupola. Far away I heard a voice say something, but I did not listen. Only after some time I understood that this voice wanted me to show my ticket or buy one. A ticket? I came back to the world – oh yes, the cash point is inside the baptistery. The voice was very friendly, repeated “ticket please” and obviously enjoyed that I was so much overwhelmed by the beauty of the mosaics. We will return to the scene of christening shown in the Orthodox Baptistery and compare it to the same scene in the Arian baptistery.